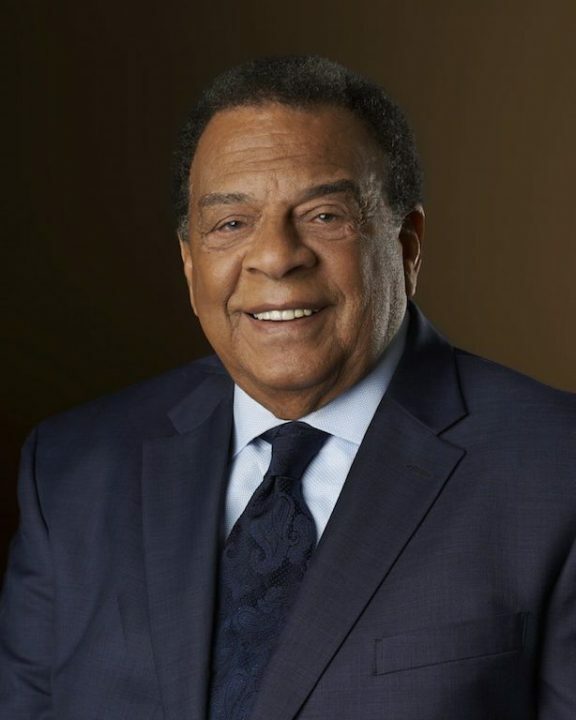 In the decades since Andrew Young helped change the course of history as a leader in the Civil Rights movement, he has built a remarkable legacy as a civic activist, elected official, groundbreaking ambassador, social entrepreneur, and adviser to presidents. Today, he leads the Andrew J. Young Foundation’s efforts to develop and support new generations of visionary leaders who will create sustainable global approaches to economic development, poverty alleviation, and the challenge of hunger. Young attended segregated schools in New Orleans and graduated early from Howard University before attending Hartford Theological Seminary. It was during his time as a pastor in southern Georgia that he became active in the Civil Rights movement, organizing voter registration drives in 1954 in the face of death threats. After a few years with the National Council of Churches in New York, he returned to Georgia in 1961 to lead the Southern Christian Leadership Conference’s “citizenship schools,” working closely with Dr. King to teach non-violent organizing strategies. He was a key strategist and negotiator during campaigns that led to the passage of the Civil Rights Act of 1964 and the Voting Rights Act of 1965. In 1972, Young was elected to Congress, becoming the first African-American representative from the Deep South since Reconstruction. He sponsored legislation that established a U.S. Institute for Peace, The African Development Bank and the Chattahoochee River National Park, while negotiating federal funds for MARTA (Metro Atlanta Rapid Transit Authority), the Atlanta highway system and a new international airport for Atlanta. In 1977, President Jimmy Carter appointed Young to serve as the nation’s first African-American Ambassador to the United Nations. Young was an architect of the first U.S. Africa policy grounded in human rights rather than simply cold war calculus, and he helped negotiate an end to white-minority rule in Namibia and Zimbabwe. Young was instrumental in the building of modern-day Atlanta. He was elected Mayor in 1981 and re-elected in 1985 with nearly 85 percent of the vote. Hartsfield International Airport, whose development he championed, made it possible for Atlanta to attract 1,100 new businesses, $70 billion in foreign direct investment, and 1 million new jobs to the region during his tenure. It is now the busiest airport in the world. The city hosted the Democratic National Convention in 1988. Young also led the successful effort to bring the 1996 Olympic Games to Atlanta. Young’s involvement with Africa has continued in the years since his term as ambassador. President Bill Clinton appointed him founding chair of the Southern African Enterprise Development Fund, and in 1996 he co-founded Good Works International, where for more than 15 years he promoted an approach to sustainable economic development in Africa and the Caribbean grounded in profitability and social responsibility. Through the Andrew J. Young Foundation and its partnerships with international agencies and the private sector, he continues to focus on expanding educational opportunity as well as innovative approaches to alleviating hunger and poverty in the U.S. and abroad. Young is the recipient of the Presidential Medal of Freedom and the French Legion d’Honneur and has received honorary degrees from more than 100 colleges and universities.